Check out our Featured, Featured MLB Free Picks for similar articles. The Cincinnati Reds will host the first place San Francisco Giants in the opener of a three-game series at AT&T Park in San Francisco Monday night. The Giants took two of three from the Reds in Cincinnati back in May and will be looking to get back on track after a troublesome road trip to start the second half of the schedule. The Reds fell 9-8 to Arizona on Sunday but can look back on a successful 6-3 homestand. Cincinnati features the worst pitching in the Majors, posting a 5.24 team ERA, but Anthony DeSclafani (5-0, 2.50 ERA) has been a bright spot. He aims for his fifth straight win in his ninth start of the season. DeSclafani was outstanding in his previous start, going eight innings allowing just two runs to the Braves and he has posted six straight quality starts and lasted eight innings in two of them. DeSclafani’s lone encounter with the Giants, which took place last season, resulted in six runs allowed over three innings. Jake Peavy (5-8, 5.15) will toe the rubber for the Giants. The Reds roughed up Peavy for eight hits and seven runs in six innings in a 7-4 Cincinnati win on May 4, but he still owns a solid 2.92 ERA to go along with a 7-1 record in 89.1 career inning pitched against the Reds. 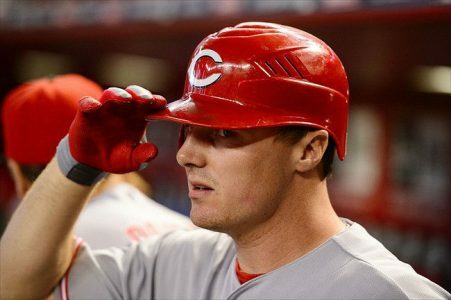 Jay Bruce is 3-for-14 against Peavy, while Joey Votto is 3-for-10. Reds are 5-2 in their last 7 overall. Reds are 9-21 in their last 30 road games vs. a team with a home winning % of greater than .600. Reds are 5-1 in DeSclafanis last 6 starts. Reds are 2-6 in DeSclafanis last 8 road starts. Giants are 19-7 in their last 26 home games. Giants are 1-7 in their last 8 overall. Giants are 19-7 in Peavys last 26 home starts. Giants are 1-5 in Peavys last 6 starts following a team loss in their previous game. Reds are 10-2 in the last 12 meetings in San Francisco. Reds are 2-7 in the last 9 meetings. The Giants return home to AT&T Park where they’re 29-17 on the season, but with the Reds recent success in San Francisco and DeSclafani on the mound the home advantage might not be enough. The price is right to back the Reds in this contest.